...its capacity on Intelsat's Ku-band mobility infrastructure. The agreement will enable the maritime communications leader, combining the power of maritime communications leaders Vizada and its affiliate Marlink, to further enhance its global broadband service offerings for the transportation, cruise and offshore segments. Maritime service providers and customers of Astrium Services will benefit from the new network enhancements on the Intelsat 22 satellite and will leverage capacity to enhance coverage for maritime VSAT services, such as WaveCall™ and Pharostar™, in the Indian Ocean. Astrium Services will also use the Intelsat 21 satellite, which is designed to provide Ku-band coverage in the southern Atlantic Ocean, expanding the maritime VSAT service capacity in regions requiring more coverage. The capacity on Intelsat 21 and Intelsat 22 will be accessed via the IntelsatOne(SM) Network Broadband product, which is built on a global network of VSAT service platforms and teleports integrated with an IP/MPLS backbone. The integration with Astrium Services' proprietary global teleport network ensures a seamless service with high levels of quality, reliability and availability. The new capacity complements available throughput on the Intelsat C- and Ku-band infrastructure that is already enabling highly reliable connectivity for VSAT customers today. WaveCall and Pharostar support the use of smaller antennas with straightforward installation and flexible packages to suit different connectivity requirements. Astrium Services is successfully testing its newest commercial VSAT offering with customers of high data allowances with speeds up to 1.5 Mbps. Service providers and customers benefit from low-cost, high-performing broadband communications with the most extensive global coverage. 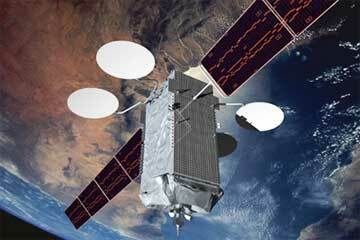 Intelsat's Ku-band global mobility network, which is scheduled for completion in early 2013, will consist of 10 beams on seven satellites.